Olivia Chow and Adam Vaughan are sniping at each other's records in race to represent progressive battleground. "I'm between the two, but Olivia Chow," Cathy Monfette, says, pulling her cellphone away from her ear long enough to answer. Monfette, a young 30-something, is having coffee with her mother — a Justin Trudeau fan — while her child looks on from the stroller. They are sitting on the patio at Aroma Espresso Bar, a coffee shop in the heart of Liberty Village, a neighbourhood she has called home for two years, and which is marked by imposing condo towers and businesses where the young and the young at heart congregate. Liberty Village is part of the new riding of Spadina–Fort York, formerly known, mostly, as the riding of Trinity–Spadina. This is where two well-known progressive Torontonians and former members of Parliament are facing off in a heated contest: Chow, widow of former NDP leader Jack Layton, and Adam Vaughan, the Liberal incumbent. Chow and Vaughan have a long history. She was the area's city councillor in Toronto from 1991 to 2005 when she left to run federally for the NDP. When — on her third try— she was elected to Parliament in 2006, Vaughan, a former journalist, defeated Chow's constituency assistant for her seat on council. When Chow resigned as an MP in 2014 to run for mayor in Toronto, Vaughan ran as a Liberal and won the byelection to replace her in Parliament. This is really a two-way race. The Conservatives traditionally have come in third. Current candidate Sabrina Zuniga, a former science teacher, made headlines last week for saying in an interview that the ground would absorb oil spills because oil is a natural substance. Oil and pipelines are not really local issues, but they are one point of disagreement between Vaughan, whose Liberals support the Keystone XL pipeline, and Chow, who opposes the pipeline. This July, Chow said, she was persuaded to return to politics and compete for her old seat. "Tom [Mulcair] called and said, 'Olivia, we need your experience in the House of Commons, to make childcare a reality for a million kids and really see to it that the transit strategy gets approved and that there be good, solid, long-term, stable, predictable, non-partisan funding for public transit,'" she told The Huffington Post Canada during an interview at Old Town, a hipster restaurant across the street from her campaign office on Dundas Street, the northern edge of the new riding. She was happy teaching at Ryerson University, she said, but then she thought of the work Layton had done to build a party that could one day "form a government." "Tom said: 'We are this close... [we] need you to do everything you can to make it happen,'" she said. Chow offered to travel across the country to support local candidates, but the NDP leader wanted none of it. Finally, she agreed, a bit late into the race but when the party was leading in the polls. People have welcomed her with open arms, Chow said. If she's worried about the effect of the riding's boundary changes on the race — the restaurant we meet in is no longer part of her riding but part of University–Rosedale — she doesn't show it. The NDP-friendly Annex neighbourhood is gone but so is the Liberals' pocket of support closest to Yorkville. In 2011, when Chow won 54.5 per cent of the vote, she lost some of the polls in the condominiums near the waterfront — an area that has exploded in growth — to the Tories. During her mayoral bid, Chow also lost in places such as Liberty Village — although voters there may have chosen to vote for John Tory to avoid a Doug Ford win. Chow said her unsuccessful run at the mayoralty isn't helping her win this current battle, but it isn't hurting her either. "The only one [thing I've heard] is 'I'm so glad you came back.' I hear that, and 'When is your office opening? What happened to your barbecue?' I had big events with thousands of people coming," she said. At the door, she said, some people are undecided. Some Conservatives let her know that her pitch is unwelcome, she said, while others tell her they like her "experienced leader." Residents want to talk about immigration, education, lowering small business tax rates, the anti-terrorism bill C-51, child care — a promise the Liberals failed to fulfill time and time again, she said — and jobs for young people. "The $15 minimum wage. It's, oh, man, people really want that. I've heard so many stories about how many shifts that some of these young people have, and that they are paying their student debt and their salary is not high enough. So their eyes light up, and [they] say 'Oh, yeah, $15 federal minimum wage, that should provide pressure, right.'" Chow tried to make the case that the $15-federal-minimum-wage pledge would encourage the provinces to follow Ottawa's example. But Vaughan appeared annoyed by the sales pitch. The NDP platform will do nothing to help the vast majority of people who work at minimum wage, he said. "The number of times that I have stopped a kid in a McDonald's uniform coming off shift, and said, 'You're not getting it, you know?' 'No, but I was told $15 minimum wage,'" Vaughan recounts in a voice mimicking a young person. "'You're not in a federally regulated industry.' 'What's that?' 'Well, banks, airlines, telecom. You're in the fast-food industry. You are regulated by the province, and the NDP is not touching that.'" In Toronto, Vaughan said, people are used to the ruse. "Rob Ford was the king of the slogans, and the NDP has adopted that type of 'sloganary' politics." One of things that animates Chow most is public transit. While both candidates share stands on several issues, she said, transit is one of the things that distinguish her from Vaughan. The NDP wants to transfer funding based on a per-capita, ridership formula, rather than deliver funding project-by-project, Chow said. A per-capita formula would allow Toronto and the GTA to reap the benefits of a federal strategy and encourage ridership, she said. "I've seen too many very partisan decisions on projects," she added. "Liberals and Conservatives have been addicted to ribbon-cutting, and it doesn't work." Local governments, transit experts and planners should decide where the money goes, she said. Vaughan actually doesn't disagree. In fact, he makes the same pitch — that local governments and the provinces, not the federal government, should be identifying priorities. The Liberals have pledged to spend an additional $20 billion on public transit over 10 years. The NDP had pledged earlier in the campaign to spend $1.3 billion annually on public transit but the numbers released in its platform Friday show the NDP only making new investments of $1.77 billion over four years. The rest of the money — $1.75 billion — comes from money the Conservatives set aside for a Public Transit Fund. Over the next 20 years, using in part that money the Tories have booked, the NDP said it would spend $12.9 billion on Greater Toronto Area transit infrastructure. But while, as both local candidates say, decisions shouldn't be made for political reasons, their respective party leaders were out on the campaign trail lending their support for specific and popular projects. On Thursday, for example, Liberal Leader Justin Trudeau said he would ensure $2.6 billion in SmartTrack funding for Toronto, as well as an additional $2 billion to electrify the GO Train system. In August, Mulcair said that, as prime minister, he would "make sure" the Scarborough subway got done. The NDP has several MPs seeking re-election in Scarborough, on the east end of the city. 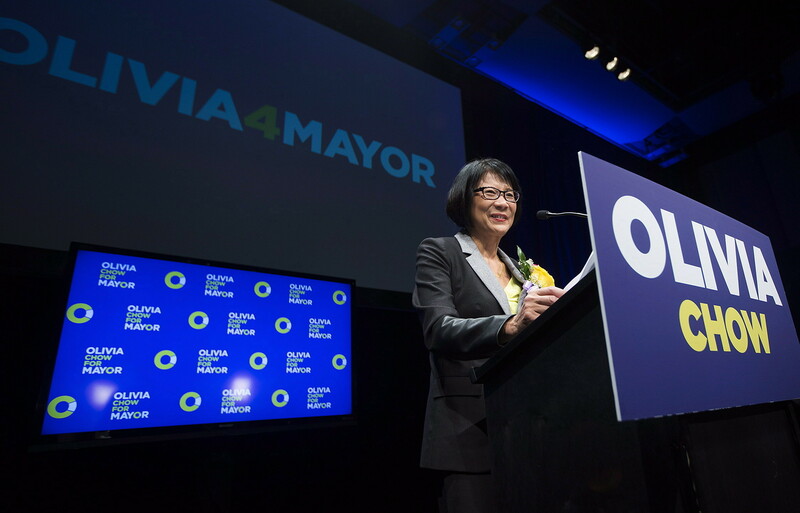 During her mayoral run, Chow had pledged to scrap the expensive and controversial subway expansion line that is popular with that area's residents. Another point of contention between the candidates is their position — and history — on affordable housing policies. The issue couldn't hit closer to home — immediately next door to Chow's campaign office is the Fort York Food bank. Mike Krysko volunteers at the food bank, which also serves hot meals to an ever-increasing clientele. He told HuffPost that Chow had never set foot in the food kitchen. "I've met Adam Vaughan. I've met Olivia Chow, out at her gala events, but nobody is just my cup of tea," he said standing by the door. "I have to worry about myself; I can't worry about them." When probed, Krysko acknowledged that housing is an issue both candidates are talking about that does concern him. "OK. That is an issue. Housing. They can bring up the housing issue, but how is that going to change things? I've been on the housing list now for 10 years, and I'm still living out on the streets." There are 21 Toronto Community Housing (TCH) buildings in the riding and quite a few co-ops, Chow said, but federal money is gone and there is no comprehensive strategy on affordable housing. "The housing you see right now, some of them are falling apart that belong to THC, so they need repair. The co-ops are really quite worried, because their agreements are finishing and they are going to lose their subsidies," she said. If the subsidies dry up, then hundreds of people could be out on the street or in serious financial trouble, she added. "What we need to see is a new affordable housing program, rent subsidy, renew the co-op agreement, built new ones and fix the existing ones." The NDP has pledged $2.145 billion over four years to renew co-op agreements, repair and build new social housing units and boost funding for homelessness initiatives. The party has also promised to provide $500 million in grants and loans to builders to add 10,000 new units of affordable and market-rate rental housing. In a recent CBC interview with all three candidates, Chow repeatedly asked Vaughan how many units the Liberals would build. Vaughan said he couldn't answer because it depended on local needs. The Liberals have pledged another $20 billion over 10 years for what the party calls "social infrastructure," money that will be directed towards affordable housing and seniors' facilities, daycare spaces, community centres and arenas, according to the party's platform. All those things need to be included in social housing plans so that you can build larger communities, Vaughan told HuffPost. If you don't, the housing projects don't do well, he said, pointing to projects built in the 1960s such as Regent Park and Lawrence Heights, where it was illegal to open a business. "If you don't build the social supports that people in low-income communities need, the communities don't thrive. When you do, the housing gets better, the community gets stronger and the economy grows with it," Vaughan said. Housing is the reason Vaughan said he got involved in politics. In September, he stood side-by-side Trudeau when the Liberal leader announced the party's national housing strategy, which also included a promise of $125 million a year in tax incentives to build and renovate rental units, as well as a new way to dip into your Registered Retirement Savings Plan to buy a new home, and a proposal to study whether federal lands and buildings could be repurposed for low-cost housing — something the NDP said in its platform that it would "mandate." Vaughan pointed to a building at Alexandra Park, something he said he had made happen and Chow had not. "She didn't do it. Alexandra Park was in terrible shape when I took over, there was a crack in the wall in the community centre, it was literally was going to fall over," he said. "Olivia's response was to bring [Conservative] Senator Nancy Ruth to an all-candidates meeting and get the senator to promise Conservative [government] money to fix the community centre." Chow's feeling, Vaughan said, was that if Toronto fixed the housing itself, it would let Ottawa "off the hook." After he won Chow's seat on council, nobody heard from Nancy Ruth again, Vaughan said. The transformation of Alexandra Park, the rebuilding of the 668-units of public housing, the addition of new public housing in some of the private buildings, the proposal — now getting under way — to rebuild the community centre were all accomplished, Vaughan said, by the city without any federal, provincial or municipal taxpayers' money. "That was all driven out of the residents association and myself. Olivia was in charge of that riding for 20 years. She may have started the co-op, which was really finishing another councillor's work, but in terms of rebuilding public housing, adding a diversity of public housing units to this riding, creating funds to repair public housing, that was driven out of a series of processes and a series of decisions that were made during my time on council, and Olivia had nothing to do with it," he said. Chow said that is not true. "The money that he used in CityPlace [a condo tower neighbourhood near the waterfront], I put aside $5 million in section 37 as a reserve fund," she said, referencing to a section in Toronto's planning act that allows the municipality to ask for certain contributions — floors of affordable housing, three-bedroom apartments or parks, for example — from property developers in exchange for permission to build something that doesn't comply with zoning regulations, such as height or density rules. "A good percentage of his first few years as a city councillor, he was in fact using the money that I had approved as a city councillor," Chow said. That assertion visibly upsets Vaughan. "I worked bloody hard for eight years to fix housing in this city," Vaughan said. "When I am told that I inherited that program from Olivia Chow, that is just factually - there is no other way to describe it - it's factually totally inaccurate and for her to suggest that is gall. It bothers me. Because we didn't have a housing program." Chow left no money, Vaughan insisted. "My record on delivering resources to public housing," Vaughan said of his time on city council, "is second to none. I will not be told that Olivia Chow was the mastermind behind my operations. She had nothing to do with it. "In politics, you have different types of politicians. We are all expected to say good things, but the measure of a politician is if they do good things. We can all deliver the platitudes about public housing, but when it comes to actually, building, repairing and delivering, that is where my record stands in stark contrast to her record," he said. "She talks a good game, but when push comes to shove, she puts politics in front of people every single time." Chow asks: What's Vaughan's record? Aside from her work on city council, Chow said, she has an impressive track record as an opposition MP. "I brought in a lot of [legislation], like cracking down on crooked immigration consultants. And the bill to protect small business owners, remember Lucky Moose, where you wouldn't get punished if you were defending your own store or your own property…I've reached across the aisle and I've done quite a lot of work with people on the Conservatives' side," Chow said. "[Vaughan] may not be familiar, or maybe he didn't think that it is important for immigrants not to get cheated by these crooked immigration consultants, but let me tell you, there are hundreds and hundreds — just in the riding — of horrific stories about people getting ripped off…. [does] he wants to talk about that?" the former MP said. What is his record, Chow asked. "Has he been able to get a lot of TCH funding? To fix the buildings? … Ultimately we need a government that will invest in people. And a government that has a leader that is experienced, principled, that would invest in housing, in transit, health care and education, and for me that's the NDP; for him it's different. We'll agree to disagree." Vaughan told HuffPost that when Trudeau announced billions for a middle class tax cut this spring, he wondered whether the Liberal leader would come through on a promise to invest in affordable housing. "I remember turning to a colleague in caucus who was part of Justin Trudeau's financial team and saying 'Where does that leave the housing commitment that Justin made to me in the byelection?' And they said, you might be out of luck. And I went straight to Justin, and I said, 'What gives?' And he said, 'Adam, relax.' And I said, 'No, I'm not going to relax. This is why I am here.' And he said, 'Look, I can't get elected in Papineau if I don't have a housing program. There will be a housing program, trust me.' I trust Justin, and he delivered." Vaughan said he is comfortable with the Liberals' plan to run deficits in order to get housing done. "You can balance the budget and cut taxes, like they do in Cleveland, but you end up like Cleveland, or you can invest in a great city and spend in a great city and grow a great city's economy, and you end up with a better place to live." Polls suggest Chow is currently leading in Spadina–Fort York. But Vaughan said he isn't worried. Pollsters can't adequately assess the riding, he said, because many of the residents are transient or have several cellphones and can't easily be reached. When he canvasses in the glassy condo towers, he said, many of the people he meets are worried about the investments they've made in a pricy condo. They worry about interest rates rising, they are mostly suburbanites who have moved into the city. These people, Vaughan suggests, are not NDP supporters but switch between being Liberal or Conservative supporters. And for those progressive voters who want to see investments in social programs, Vaughan said, what they want most is to get rid of Harper. When the polls swing — as they appear to be doing now — a lot of people who parked their vote with the NDP are going to come back to the Liberals, he said. "I think that people have no hesitation moving back between two progressive candidates. What they want to see is a clear way to defeat Harper, and as the polls start to move — and they have — a lot of people who may have parked their vote with the NDP… suddenly will realize that Justin Trudeau is actually ready." Chow is undeterred. She has always represented condominiums, she said. "Either as a city councillor or as an MP, so I'm very familiar with connecting with people who live in condominiums." A lot of the new residents are young people who have just moved in and they like and are open to a new way of doing things, she said. "The NDP is different, it's not the same old same old, and a lot of people say 'yeah, we like the NDP. You guys are not the same old parties.'"